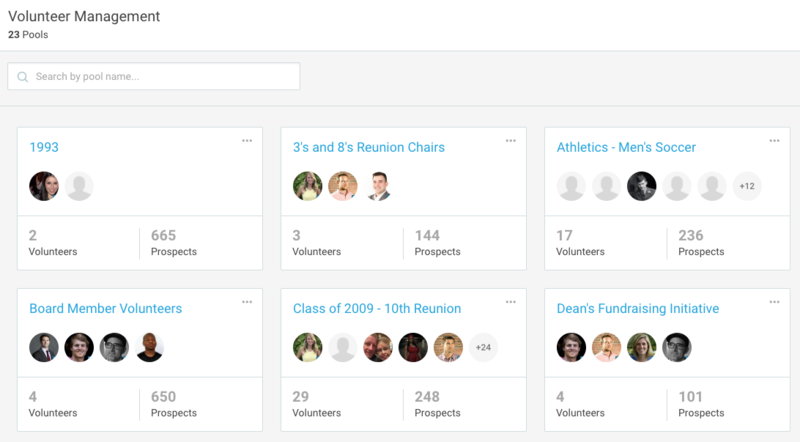 In Volunteer by EverTrue, all assignments and prospects are organized by Pools. Pools are defined based on your institution's volunteer program and help organize/categorize your volunteer program for easy management and reporting functionality. Think of pools as volunteer categories or buckets. As an example, if your institution runs a class based volunteer program, you may find it useful to setup a pool for every class year. You can also create affinity based pools, pools for specific campaigns, or select groups of people like your trustees. A volunteer or prospect can be listed in as many pools as necessary. However, we recommend that the pairing of a prospect to a particular volunteer be unique across your institution's volunteer program. E.g. Prospect Paul is assigned to Volunteer Valerie in the Class of 2009 pool. Paul may also be a prospect in the Athletics pool. However, in Athletics he is managed by Volunteer Victor instead because Paul and Victor were on the rowing team together.